Your email address will never be sold or given to anyone, only used to let you know about upcoming band events. We have smaller groups that are part of the Pops Band that we will email you about as well. Thirty-five years ago a handful of musicians gathered in Clancy Wolf’s garage to enjoy themselves making band music. It was recreation, fun and fellowship. Today the band has grown to about 100 members and plays free concerts to thousands of West Valley audiences every season. 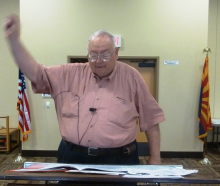 The Sun City Polka Band was organized in 1976-77 by Clancy Wolf who was the director until his death in 1991. The band had its origin in Clancy’s garage with 6-8 members. As the band grew they became a chartered member of the Recreation Centers of Sun City and rehearsed at the Bell Recreation Center. 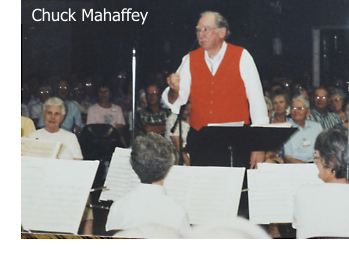 Chuck Mahaffey was the assistant director with Mr. Wolf and took over the band in 1991. He directed the band between 1991 and 2000. Mr. Mahaffey at the time had over 30 years of teaching experience in the grades, high schools, and universities of Iowa and Minnesota. He had a Bachelor and Master of Music Education degrees from Drake University, had a trumpet major and percussion minor, was a member of the American School Band Directors Association and was a member of Phi Mu Alpha Sinfonia International Music Fraternity. 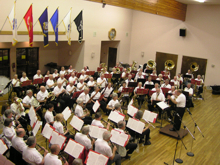 As the band progressed through the years they also added many varied selections to the program, and they added the word POPS as part of their name. Instead of the Sun City Polka Band the name was changed to the Sun City Pops Band. They still included polkas in their program, but also added show tunes, vocal selections, and much of the repertoire of the modern and days-gone-by concert bands. Dave Leppanen took over the band from Chuck Mahaffey in September of 2000. 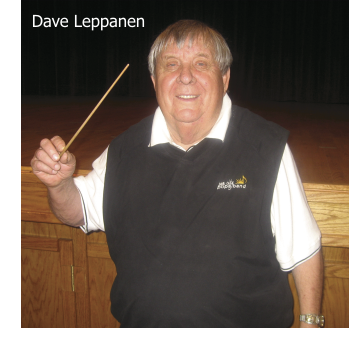 Mr. Leppanen is a graduate of St. Olaf College in Minnesota with a degree in music education and performance. He played with the 75th Army Band in the 1950s, played in many combos, taught music in junior and high schools in Iowa and Michigan, and was a band director in Hibbing, Minnesota. During his tenure the band played a number of concerts each year. With donations from these concerts they were able to purchase music and instruments. All work was volunteer. 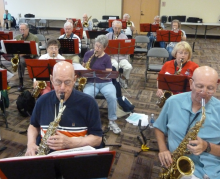 They rehearsed at the Marinette Recreation Center in Sun City, Arizona. There was never any charge for the use of the Sun City practice facilities or storage of their music and equipment or playing at Sun City recreation facilities. It was the band’s contribution to Sun City and Sun City’s contribution to the band and the people of Sun City. 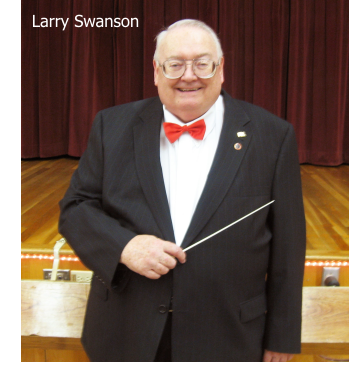 Larry Swanson became the band director in 2009 when Dave Leppanen retired. Larry’s musical background was a perfect fit for the 85-piece band. Larry studied music at Harvard, Boston University, and Western Illinois University. He has degrees in music composition, theory, education, and percussion. After studying under the principal percussionist of both the Boston Symphony and the Boston Pops Orchestra for many years he turned his skills to directing bands in junior high and high schools. Eventually retiring to Sun City West, he has played in many musical groups. The pops band, under Larry’s direction, played to full houses every concert. 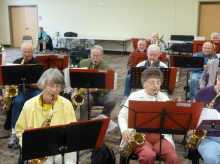 Throughout the years the band has been associated with the Sun City Recreation Board. There was never a charge to play or for the use of the concert facilities for over 30 years. 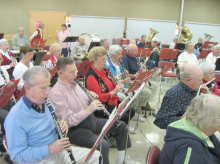 In 2012, more than 33 years since its inception, the Sun City Pops Band had a crisis. The board of directors of the Recreation Centers of Sun City decided to charge $2 to each non-Sun City resident for each practice and to charge rent to play concerts at Sun City Sundial Auditorium where the band had played many concerts at no rental charge. The band couldn’t afford to function under these new regulations. They had no sponsor and the only monies collected to run the band were from free-will donations at the end of each concert. 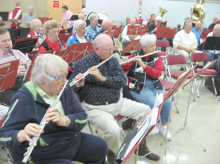 These free-will donations were not enough to cover the costs of renting the Sundial Auditorium plus the $2 per non-Sun City band member per practice. Consequently the band could not afford to stay in Sun City and so they found a sponsor in the Valley View Community Food bank. They changed their name to the West Valley Pops Band. Rehearsals now take place, free of charge, at the food bank. It was a great move not only for the band but also for the people of Sun City and the West Valley. We are now playing at the Performing Arts Center in Surprise and other venues in the West Valley. The band still keeps the tradition of not charging for a concert. However they do ask the audience to bring a nonperishable food donation to the concert for the food bank. So far it has been a win-win situation. Each concert brings in many pounds of food and plays to a full house not only at the Performing Arts Center in Surprise but also at various RV and other venues in the West Valley. The needy people of the West Valley benefit from this additional food. The food bank gives the band free space to practice and store their equipment and music. The musicians get to keep playing, and the audiences from the whole West Valley enjoy great pops music. Members of the band come from all walks of life. Some are former music educators (vocal and instrumental). Many members are from the professional music ranks of symphony, community and national ensembles. 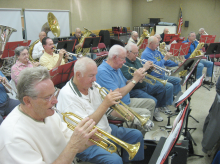 Many were former dance band members in the good old days of the popular big band era. All are from the West Valley which has a tremendous amount of musical talent. Other members include people who took part in the music education programs in the grade and high schools and continued to play in universities before pursuing their chosen careers. Now that they have retired they dig out the old instrument, join the pops band and double their pleasure in retirement.